All the bridesmaids gather together for a photo of their beautiful bouquets, organized and designed with love by talented florist Elena Damy. These gorgeous floral arrangements combine multiple types of white flowers, including stunning white roses. In this photo, the color combination of pale pink, creamy white, and dark forest green remind us of spring in Cabo San Lucas! This color combination was fresh, fun, and consistent throughout the wedding! The fresh bouquets look lively and bright, standing out against the pink shades of the bridesmaids’ dresses. 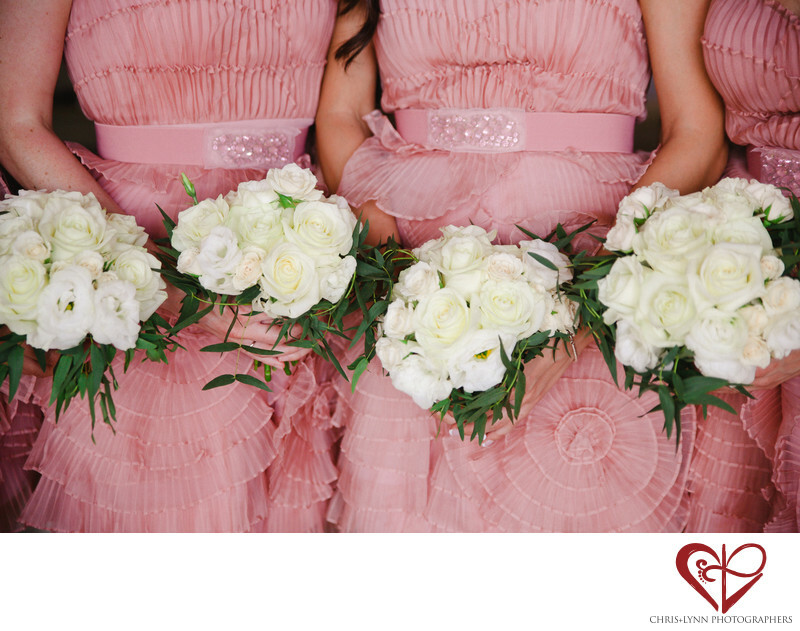 In this shot, we can also see the pink jewels adorned on a pale band of the bridesmaids’ dresses. These ladies will look so great standing alongside the altar while the bride and groom say their vows during the ceremony. 1/640; f/2.8; ISO 400; 63.0 mm.